A 3rd release of the v1.1 firmware, for the first time this one is hosted on the official Gemei homepage. Users hare reported that APP extensions must be changed back from .cc to .c3s, etc.  urn on the GA330 and it should immediately start the update process. If the update does not start holding SELECT + START will force the update process. 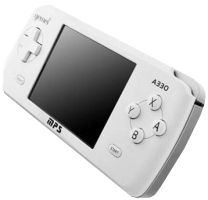 Gemei MPS A330 Firmware v1.1 Build-3 2/18/11 NEWEST!